Let Still Waters Catering Company translate your vision into reality. No one puts more emphasis into making catering services seem effortless than Still Waters Catering Company. From the initial customer contact to the final invoice, we insure that every aspect of each special event is handled professionally and expeditiously. Our catering team executes these events with style and precision. Our catering team will treat your party with respect and dignity regarding the special details that can really make a party shine. All your catered functions will be professionally prepared and served, ensuring optimum quality at a reasonable cost. In house functions from a continental breakfast, coffee break or delicious plated sandwiches to full service banquets and catered services with all the finer touches that can be staged from our 18,000 square foot kitchen. Still Waters Service has all your needs covered. 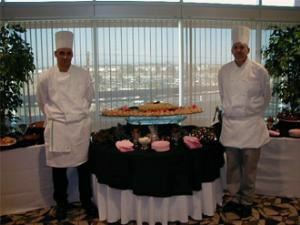 From complete buffets, full service meals, hors d’oeuvres, cocktail receptions to board and corporate meetings, Still Waters Service can make any gathering an event to brag about.